Nikola Krajačić 30. 9. 2011. Farmeron, a fresh internet startup from Osijek, Croatia just raised an investment and support from Dave McClure's seed fund and startup aggregator 500 Startups. Matija Kopić, CEO of Farmeron confirmed, exclusively for Netocratic, that Farmeron team will move to Mountain View in Silicon Valley in the next ten days or so. 500 Startups is one of most powerful US startup accelelators run by Dave McClure, former CMO in PayPal. Altought Kopić couldn't confirm how big the investment is, it is known that 500 Startups' first rounds of investment start at 100 thousands dollars, and most of the time it's somewhere around 400-700 thousands dollars or even a million. 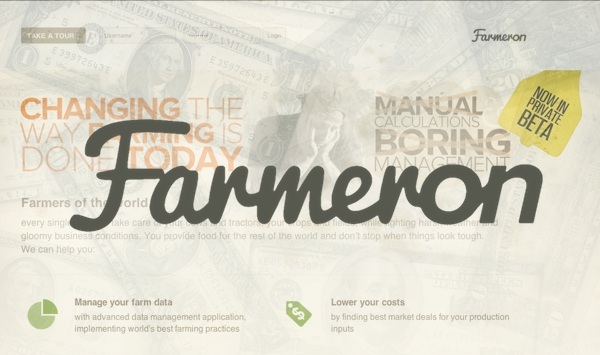 Farmeron, a fresh internet startup from Osijek, Croatia just raised an investment round and support from Dave McClure’s seed fund and startup aggregator 500 Startups. Farmeron was featured for the first time at Mini Seedcamp in Ljubljana after which they attended Seedcamp Week in London. Althougha finalist, they didn’t win, but they were declared the most interesting startup. GrabCAD, the winner of €25,000 in seed capital decided to pass the funds to Farmeron, since they (GrabCAD) had raised enough funding already from Matrix Partners and Atlas Ventures. Matija Kopić, CEO of Farmeron confirmed,exclusively for Netocratic, that Farmeron’s team will move to Mountain View in Silicon Valley in the next 10 days or so. Farmeron is a web application that will give you detailed analysis of your cattle. That’s right, Farmeron is something like Google Analytics for farms. 500 Startups has made investments in startups like Geckoboard, Hipster, SendGrid, Recurly, Flowtown, BlackType… the latter one eventually got acquired by Twitter. 500 Startups is one of most powerful US startup accelelators run by Dave McClure, former CMO in PayPal. Altought Kopić couldn’t confirm how big the investment is, it is known that 500 Startups’ first rounds of investment start at 100 thousands dollars, and most of the time it’s somewhere around 400-700 thousands dollars or even a million. Farmeron has a large market to conquer, and if guys to the job right, they shouldn’t have too much trouble as they have only a few competitors. Good luck Farmeron! Nikola je na internetu poznatiji pod nadimkom blackshtef; kao student FOI-a intenzivno se bavio community managementom, no nakon završetka diplomskog studija kreće u vode e-bankarstva. Ajmo dečki, pokažite im kako se to radi!